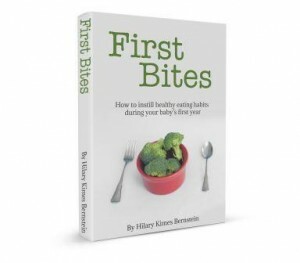 I’m taking part in the NBC Green is Useful Eco Eats Challenge! I’ve swtiched over to using reusable cloth instead of paper towels at home. I used to love using paper in my kitchen – paper towels, paper napkins and, every now and then, paper plates. In fact, the idea of a paperless kitchen never crossed my mind. Several times a day I sprayed down my table and counters with antibacterial cleaners and wiped everything clean with paper towels. 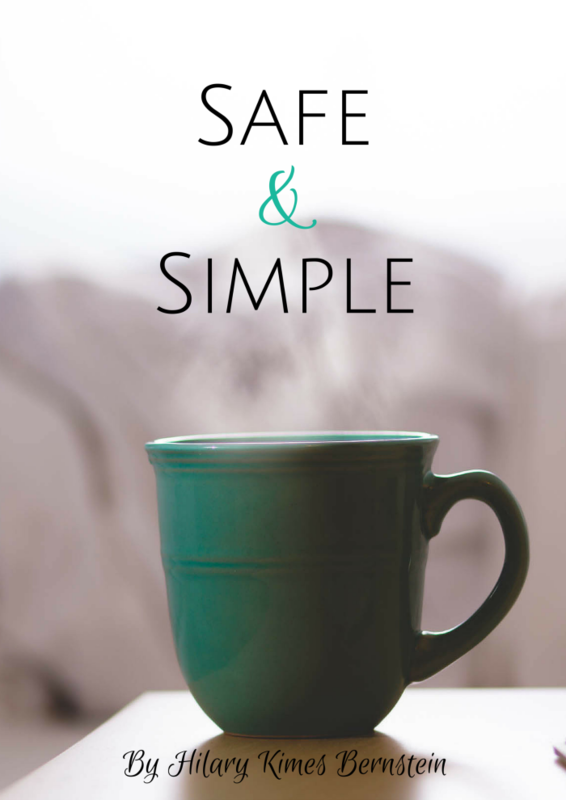 Even when I started using safe cleaners – whether Shaklee or homemade concotions – I still used paper towels. It wasn’t until a year ago that I started feeling guilty about using paper towels. Did I really need them? I started using Norwex microfiber cloths to clean and quickly found I didn’t need any sprays or paper towels. 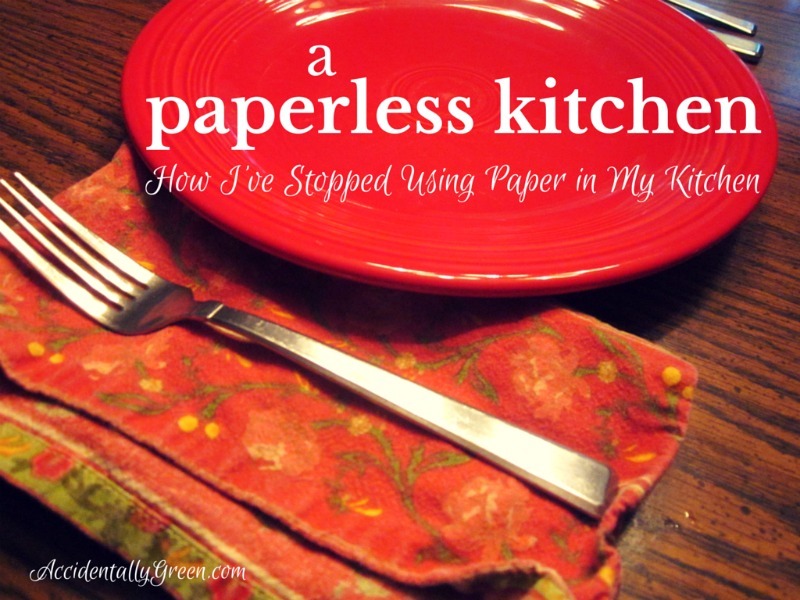 So how have I eliminated using all paper products in my kitchen? I use cloth napkins at every meal. Over the years I’ve stocked up when I’ve found great sales. I keep about 2 dozen on hand and wash them every couple days. Aside from a stash of themed paper birthday napkins, I don’t keep any paper napkins in our home. I’ve stopped buying paper towels and have found ways to make do. I use Norwex microfiber for all of my cleaning. I use cloth kitchen towels for drying my hands – and dishes. (Simply change to fresh towels every day, or more often, if necessary.) I do miss paper towels after I’ve fried bacon or need to cool a batch of cookies. I’ve started using old linen tea towels instead of paper ones to absorb the grease. Because they’re old, I don’t mind if they end up with stains. I don’t buy paper plates, so I have no choice to use anything but my stoneware Fiesta plates. 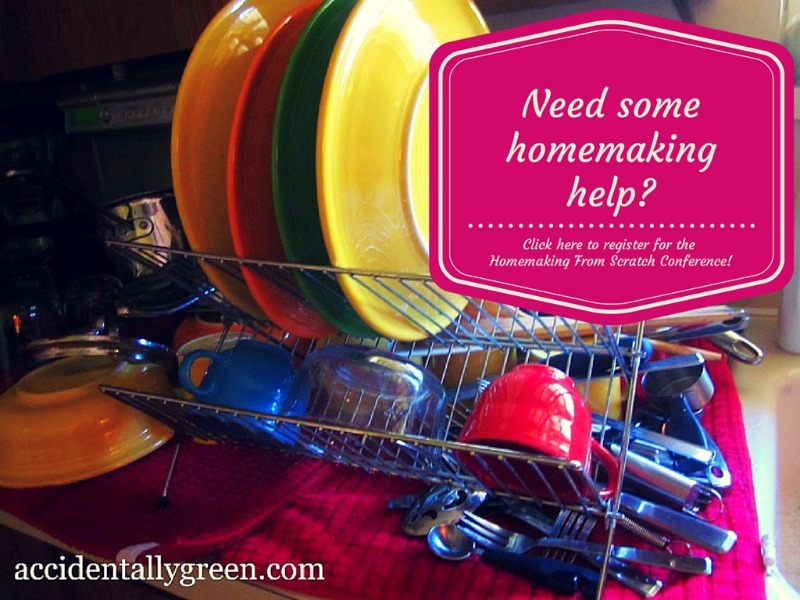 I don’t miss paper plates – and without a dishwasher, I wash all of our dishes by hand. Instead of using paper lunch bags, I use resuable lunchboxes . I do keep a roll of waxed paper on hand for baking needs, but one box easily lasts more than a year. First, make a decision to stop replenishing paper goods. Then, prepare. Watch for great deals on cloth napkins (trust me, they’re out there!) or reusable lunchboxes. Gather all of your dishtowels so you have a handy stash for moments when you’d typically grab a paper towel. Finally, enjoy the savings! Remember, you’re not only reducing waste, but you’re also saving money. 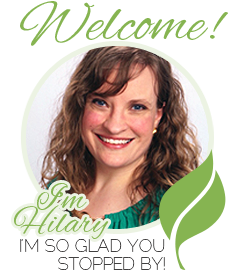 You can learn other healthy, green kitchen tips – as well as plenty of other homemaking hints – in the Homemaking From Scratch conference. Buy tickets at any time and gain instant access to the conference. Plus, conference downloads will always be available to you. Are you interested in ‘eco-eating’? NBC’s Green is Universal is hosting an “Eco Eats” sweepstakes from September 29 – October 17. To join, visit their free green-living tool, One Small Act, and join the “Eco Eats” challenge. 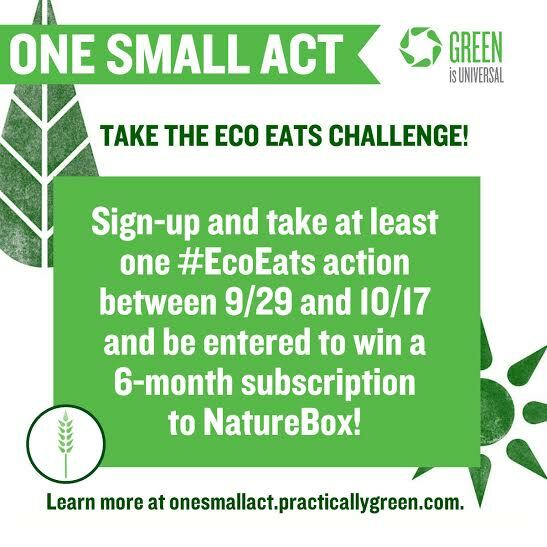 Everyone who signs-up and tackles at least one action by October 17th will be entered to win one of five 6-month subscriptions to NatureBox. No Purchase Necessary. Must be US resident and 18+. Read official rules here. 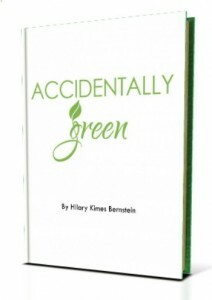 Disclosures: In exchange for participating in the challenge and writing this post, I was given a gift package from Green is Universal. All opinions here are still my own. Purchasing items from links in this post will result in a commission for Accidentally Green. Thank you! How have you switched from paper to cloth in your own kitchen? « What Do You Think Clean Smells Like? What would you consider a good price on cloth napkins? Can I ask where you found yours? I’ve never used paper towels (thanks to my mom, who always ripped up old towels for cleaning rags), but I am addicted to paper napkins, lol! Thanks! I found my napkins at a local discount store for $8 for a dozen napkins. (If you live in Ohio, it was in Marc’s closeout aisle.) Since I use the napkins for years and years, I consider it a great deal! This sounds a lot like my kitchen, even down to the no dishwasher! Sometimes we do rely on paper plates, but that’s usually only after having a new baby. I love not wasting so much, and our trash bill is lower because of it, too!